Bullets (in red) inch towards title. 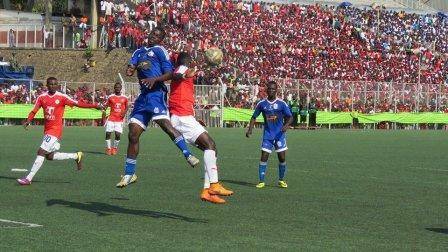 Malawi giants Big Bullets are closing in on their second league title in as many years after beating Moyale 3-1 in week 22 of Super League action which has seen them take their tally to 44 points from 19 matches. The defending champions have now opened a 17 points gap with their bitter rivals Mighty Wanderers who are now on position 9 on the table with 27 points having played 18 games. Kamuzu Barracks have conceded the least goals with 15 after playing 20 league matches and are remaining with 8 games to wrap-up their 2015 season. Dedza Young Soccer remain the most porous in defence after having conceding 38 goals out of 20 games this far followed by Epac FC who have conceded 37 league goals. This season, leaders Big Bullets are the highest scoring team out of the 15 super league teams having scored 37 goals in 19 super league matches. Big Bullets is also the only team out of the 15 teams which is still unbeaten at their own backyard while Airborne Rangers and Fisd Wizards are yet to register a win away from home. A total of 389 cards have been brandished in Malawi’s elite league and out of the 389 cards 20 are red cards whereas 369 are yellow cards. Green Harawa: Leading goal scorer. Kamuzu Barracks this far have recorded five red cards followed by the Nomads who have three red cards, while Red Lions, Moyale, Azam Tigers and Mafco F.C have two red cards each. Blue Eagles, Airborne Rangers, Epac F.C, Moyale and Silver Strikers are having a card to their name. 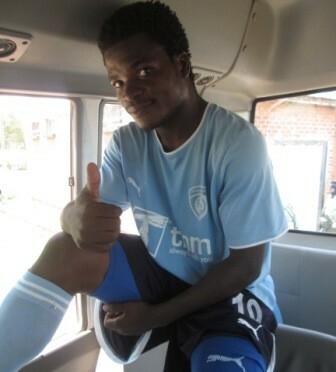 Davie Banda of Kamuzu Barracks and Richard Mbulu of Mafco are the only players who have been red carded twice this far in Malawi’s elite league. Peter Mponda’s Fisd Wizards are anchoring the log table with 14 points from 20 super league matches and they remain with only 8 matches to finish the season. 4 Goals: Richard Mbulu, Hassan Chapola, Emmanuel Chipeta and Paul Phiri (MAFCO F.C), Muhammad Sulumba and Mapopa Kaunda (Be Forward Wanderers), Yamikani Fodya and Mussah Manyenje (Big Bullets), Muda Jeffrey (EPAC F.C), Ndaona Limbani (Red Lions), Peter Katsonga (Azam Tigers), Manasseh Chiyesa (Kamuzu Barracks) and Wacheta Mwenefumbo (MZUNI F.C). We are nt afraid of LIMBAN anaphunzisidya mpira ndi james chilapondwa ndipo maunde wachira no chance for him. BREAKING NEWS omwe adakongoza bibi ndalama anenetsa kuti adzalanda chikho cha league kwa timuyi panthawi yomwe adzapatsidwe komanso ndalama. Kodi osewera abibi adzapatsidwa chani potha pa season ino? Wozaa!! Maulle glory 2 God. ndie bola malawi 23 imabweresa nkhan yogwirizana ndi picture koma Malawi 24 ndi manyaka gyz.